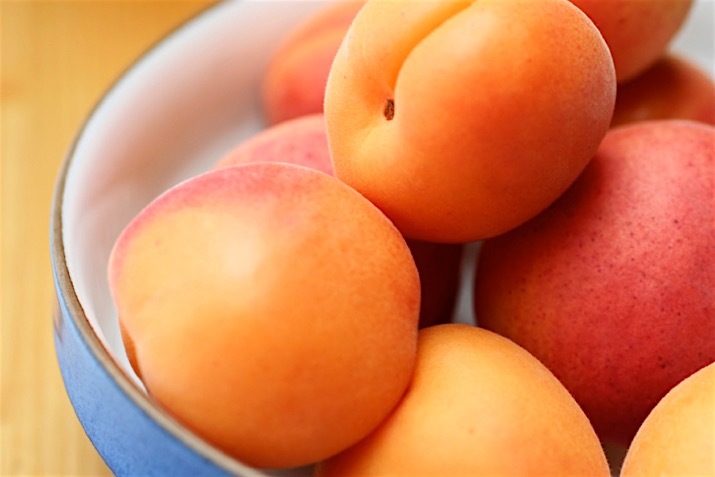 A member of the rose family and a relative of peaches, apricots have been around for over 4,000 years. The fruit is thought to have originated along the Chinese/Russian border and spread throughout Europe via the "Silk Road" to the Mideast. Because they believed it came from Armenia, the ancient Greeks named the plant Prunus armeniaca, or "Armenian plum." The Romans called it praecox because it was precocious; it flowered earlier and produced fruit earlier than the peach. Today, you can find apricots growing prolifically along roadsides in Turkey and Armenia, and you'll find the fruit included fresh and dried in all kinds of sweet and savory dishes throughout the Middle East. Spanish explorers introduced the fruit to California in the 18th century, where it flourished in Spanish missions. California now provides about 95 percent of the apricots produced in the United States. Other apricot-producing states are Washington and Utah, and the top apricot-growing countries are Turkey, Iran, Uzbekistan, Algeria, Italy, Pakistan, France, Morocco and Spain. Apricots are a stone fruit, which means they have a fleshy exterior with a hard pit around a tiny seed—like peaches, plums, nectarines and cherries. They're prolific, with trees that produce for 20 years or more. Apricots have a short growing season, though, and they're highly perishable; over half are canned to preserve them. One of the best sources of beta-carotene, you'll need just one fresh apricot to fulfill your recommended requirement for the day. Apricots are also a very good source of vitamins C and E and a good source of iron, potassium and dietary fiber. Here are just a handful of the many varieties of apricots you're likely to find in the produce section of your food co-op: Angelcot (white-fleshed and very juicy), Apium (yellow-skinned, with a plum-like taste), Blenheim (yellow/orange flesh, very juicy and sweet), Harglow (orange with a red tint), Moorpark (a large, juicy heirloom variety with brown/red skin and yellow/orange flesh) and Sungold (bright orange, mildly sweet, small). Manchurian apricots are small and mild flavored, used for drying. Whether eaten out of hand (which it fits nicely in) or sliced on cereal, cooked into brightly colored preserves or a luscious sauce for meats or desserts, the aromatic apricot delivers sweet, juicy flavor—with a faint or distinct tartness, depending on the variety. Feature apricots in muffins, scones, pies, tarts or coffee cake with cream cheese, or dip them in melted chocolate and serve them on a fruit tray along with hazelnuts. Include them in blender drinks and atop yogurt and cottage cheese. Apricots are equally delightful in savory dishes as well as sweet. Carrot and Sweet Potato Tzimmes, a traditional Jewish dish, is great as a side or main vegetarian dish when served with grains. And while it uses an array of spices, Moroccan Chicken and Apricot Tagine is easy to prepare and oh-so-satisfying. As with other fruits, grilling enhances apricot's sweetness. For a special appetizer, try Grilled Apricots with Smoky Blue Cheese and Almonds, served on crostini. Or use Grilled Apricots with Chevre and Honey as an appetizer, on a salad or as a dessert. Learn more about grilling all manner of fruits and vegetables in The Fruit and Veggie Grilling Guide. Apricots are one of the most potently delicious dried fruits, too. Try them in your next batch of granola, quick bread or trail mix. Apricots are available from mid-June through mid-July from California and from mid-July through mid-August from Washington. Those you see in February and March probably come from outside the U.S. While they can be tricky to grow in cold climates, there are late-blooming varieties of apricots that increase success. Read about Planning a Small Home Orchard. When choosing apricots, look for uniform, rich color, from burnt orange to pale yellow, depending on variety. The skin is fragile, but it should be fairly firm and plump, with no large bruises. Apricots are ready to eat when soft to the touch; they should give to gentle pressure. While an apricot might ripen in color and texture, the flavor of the fruit won't ripen after it's picked from the tree, so it's best to purchase a fully ripe fruit. Leave the fruit out on your counter if you're going to eat it within a couple of days; otherwise put it in the refrigerator.